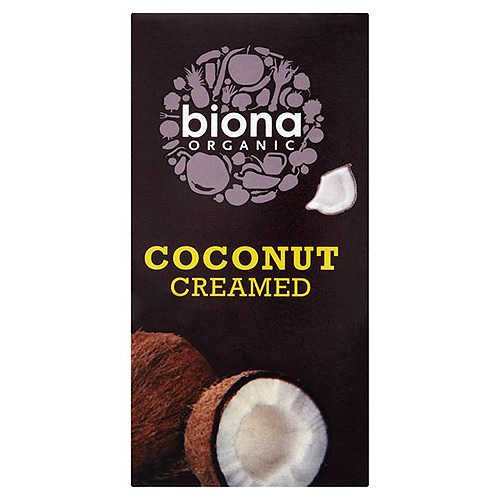 Biona Creamed Coconut is made from the finest selected organic coconuts, grown and processed to strict EC rules for organic agriculture. Creamed coconut can be used to add richness and flavour to many Indian, Thai and Caribbean dishes. Biona is a brand created by Windmill Organics Ltd, a company committed to providing high quality organic food for everyone to share and enjoy. They believe in great tasting, thoughtfully prepared food to complement an ethical lifestyle. In savoury dishes add creamed coconut grated or in small pieces towards the end of cooking and stir in. Creamed coconut is also suitable for use in desserts, cakes and as a substitute for coconut milk (50g dissolved in 100ml warm water). Depending on storage temperature, some separation of the coconut oil may occur. This does not affect the quality of the product. 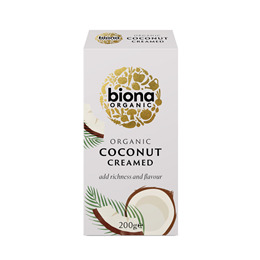 Below are reviews of Biona Organic Creamed Coconut - 200g by bodykind customers. If you have tried this product we'd love to hear what you think so please leave a review.